To end the New Year celebrations, bring the family to the popular and colourful Lantern Festival organised by the Canberra Branch of the Australia China Friendship Society (ACFS). Bring your own picnic (water and snacks for sale) and your own lantern, or buy one there. Prizes for the best hand-made lanterns. Cook Community Hub, 41 Templeton St.
For adults and children (young children will need to be accompanied by adults). Cost $3 per person. Bring a cutting board, scissors, ruler and pencil. At the AGM the ALMA Committee reports on its activities in the previous year, present the audited financial report of the association and elects the new management Committee that oversees the operation of the CAECC and the association more broadly. Members of ALMA interested in getting involved in ALMA and its activities, promoting Mandarin education more broadly or just want to learn more about ALMA are encouraged to consider joining the committee. DESCRIPTIONIn the Name of Confucius is the first documentary exposé of China’s multi-billion dollar Confucius Institute (CI), a Chinese language program on foreign campuses, and the growing global controversies surrounding it—loss of academic integrity, violations of human rights codes, foreign influence, and even potential infringements on national security. 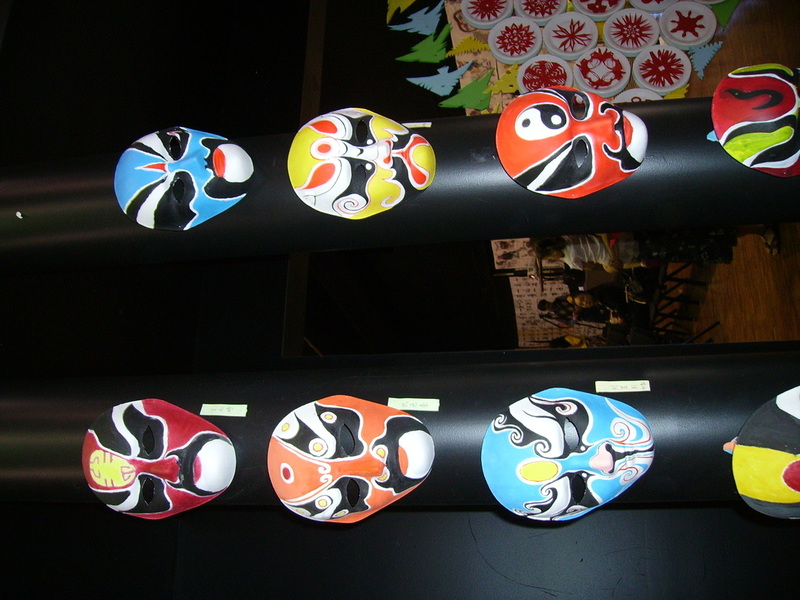 There are Confucius Institutes in 14 Australian universities and 67 Confucius Classrooms in schools. ​Since its completion in 2016, In the Name of Confucius has won 10 international awards and nominations, and seen highly successful screenings in America, Canada, Poland, Taiwan, Spain, South Africa, and Germany. Audiences described the film as an eye-opener to a hidden truth and a timely reminder of an important issue—how we should deal with the unintended outcomes of our strengthening ties with a rising Communist China, as Beijing spends an estimated $10-billion annually on “external propaganda”, including the Confucius Institute initiative. Share creative time with the family as we search for dragons in the Asian art galleries. Dr Nicholas Ng, Erhu player and academic,draws from his research on music in and from China and presents a program of secular and sacred music, in connection with Infinite Conversations: Asian and Australian art exchange. Cost: $10 for adults and children over 6 years old. Free for children under 6. Activities include folk dancing, a Lion Dance and martial arts, culminating in a Lantern Parade along the shores of Lake Burley Griffin. 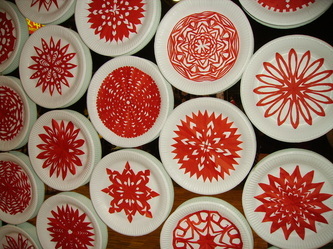 Bring your own lantern (there is judging of the best hand-made lantern*), or buy one at the Festival. Bring a picnic and enjoy an evening by the Lake. Snacks and drinks will be available for purchase. Chinese New Year's Day in 2018 is on February 16, 2018. Chinese New Year (春節 or 春节 [Chūnjíe]; 農曆新年 or 农历新年 [Nónglì Xīnnián], 過年 or 过年 [Guònián] is also known as the Lunar New Year or the Spring Festival. It is the most important of the traditional Chinese holidays. Next year is the year of the dog. You can celebrate the New Year at the National Multicultural Festival in Civic. 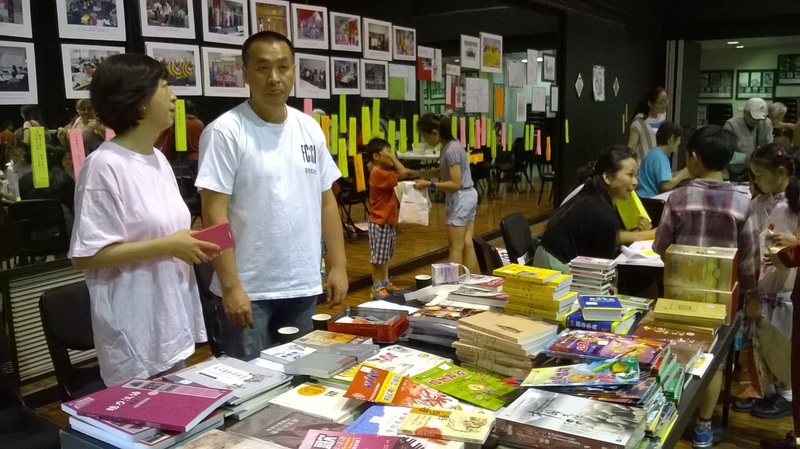 The Federation of Chinese Associations of ACT and the Austfeng Group are organising several events at the Chinese Village. About 20 art troupes from China and performers from local Chinese organisations will entertain you with dancing, singing, martial arts, lion dancing, dragon dancing, acrobatics and magic. Stage 3, City Walk, Canberra City. Since 2015, ALMA has been collaborating with the Australian Centre on China in the World at the ANU (CIW) to organise and administer an ambassador/mentoring project to promote and enrich Chinese Studies in ACT schools. In 2017, ALMA helped link six ACT schools with eight ANU students and one researcher. 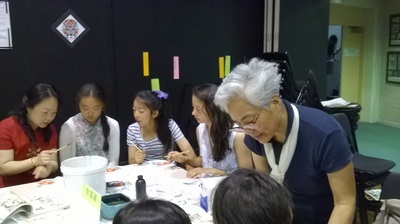 ANU mentors assisting with school Chinese language programs have developed ongoing relationships with some schools. During their visits, ANU mentors share their enthusiasm, experience, and knowledge of Chinese language and culture to help teachers and inspire school students. 10-12 AM: Albert Hall [Note change of venue]. An opportunity to meet models wearing traditional clothes. From midday there will be a dragon dance and the chance to be photographed in traditional Chinese outfits. 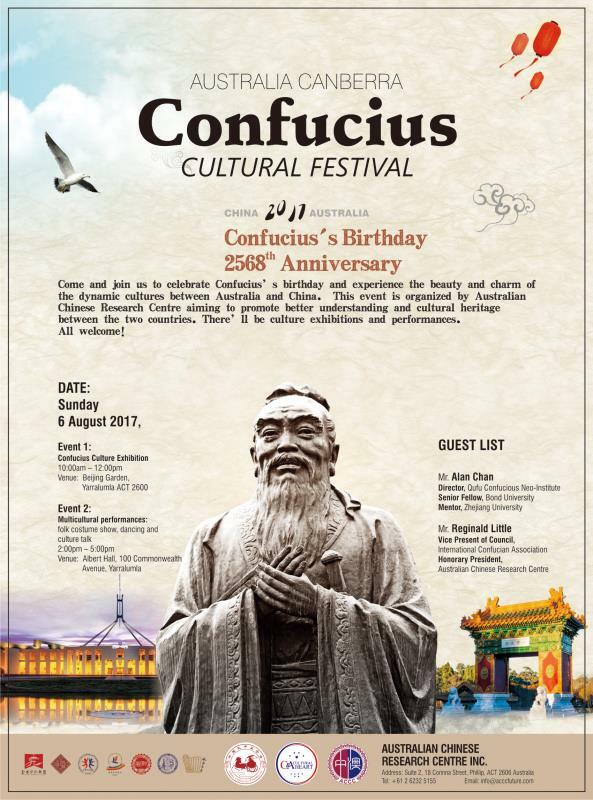 This inaugural Canberra event is part of an International Confucius Cultural Festival held in several other countries. Organized by the Australian Chinese Research Centre Inc, the aim is to promote better understanding and cultural heritage between Australia and China. All events are family friendly and free. The author, Robert Macklin, will speak about the book, with introductory remarks by Professor Richard Rigby, Executive Director, ANU China Institute. The Chinese 'presence' in Australia extends from well before the time of Captain Cook - trading with northern Australia long before Europeans came here - right through to the present day, with Chinese activities ranging from being the main customer for our iron ore, to their very extensive intelligence operations here. Robert Macklin has traced a new history of the two nations. Macklin's engrossing narrative reaches from pre-colonial times, to John Macarthur's 'coolie' shepherds, the only Chinese bushranger, Sam Pu, and the multiple atrocities committed against the Chinese in the gold rush; through to the 20th century, where the two Australians - 'Morrison of Peking' and William Donald - played a significant role in the downfall of the last Chinese emperor and the creation of the first republic, before World War II and decades of Cold War brinkmanship; to our current economic bonds and Australia's role in the dangerous geopolitics of the South China Sea. The book will be launched by Professor Richard Rigby, Centre of China in the World, ANU. Following the launch, the author, Dr Loy-Wilson will give a short talk about these little known people and period of time in Australian-Chinese relations. In the first half of the 20th century, a diverse community of Australians settled in Shanghai. There they forged a 'China trade', circulating goods, people and ideas across the South China Sea, from Shanghai and Hong Kong to Sydney and Melbourne. This trade has been largely forgotten in contemporary Australia, where future economic ties trump historical memory when it comes to popular perceptions of China. After the First World War, Australians turned to Chinese treaty ports, fleeing poverty and unemployment, while others sought to 'save' China through missionary work and socialist ideas. Chinese Australians, disillusioned by Australian racism under the White Australia Policy, arrived to participate in Chinese nation building and ended up forging business empires which survive to this day. The book follows the life trajectories of these Australians, providing a means by which we can address one of he pervading tensions of race, empire and nation in the 20th century: the relationship between working-class aspirations for social mobility and the exclusionary and discriminatory practices of white settler societies. 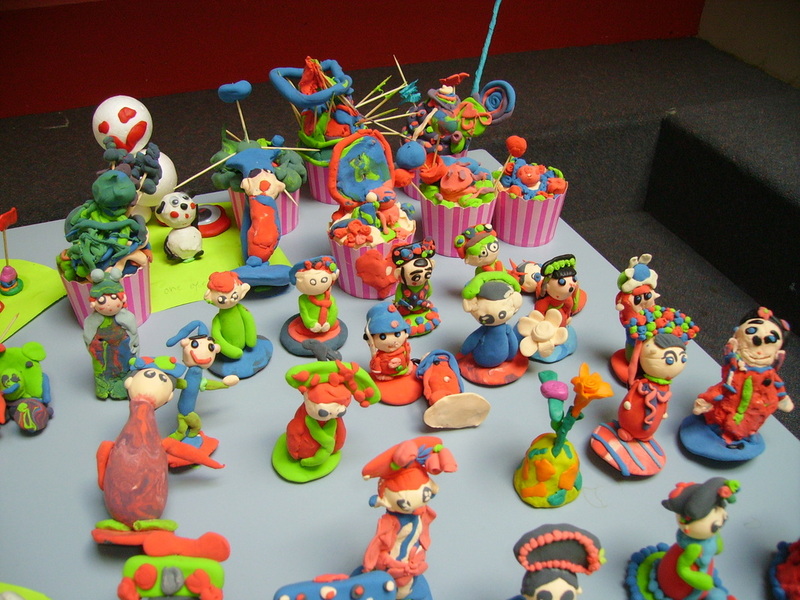 A colourful and exciting event for the whole family. Bring your own picnic and enjoy the colour and spectacle of the traditional Chinese Lantern Festival. Performances by dance groups, martial arts groups, the Mawson Primary School choir, musicians and the exciting Lion Dance! Bring your own lantern or buy one at the event. Prizes for the best hand-made lanterns. If you need help making a lantern - see details of workshop below. For further information: email acfsevent@gmail.com or ring Carol on 6247 8231. Come and make a lantern, be creative and then take your lantern to the Lantern Festival! For adults and children (young children will need to be accompanied by adults). Bring a cutting board, scissors, ruler and pencil. Workshop Bookings essential to acfsevent@gmail.com or ph Jean 62547732. Wednesday 9 November, 6.15pm to 7.30 pm. Inviting all ALMA members to come along to find out what the ALMA committee and the association have been doing over the past 12 months, future ideas and goals, and/or how you can get more involved in the operation of the ALMA bilingual childcare centre or Mandarin education more broadly. 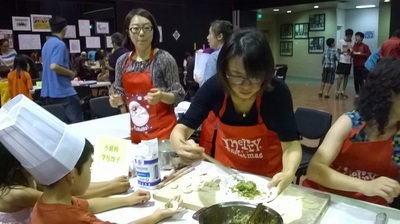 ​Come and celebrate the mid-Autumn Festival on Saturday 10 September. Organised by local Chinese community groups, the festival will be a great family event with cultural displays, food and lots of interesting activities. Due to the inclement weather conditions, it will be held under cover at the Old Bus Depot (21 Wentworth Ave, Kingston). 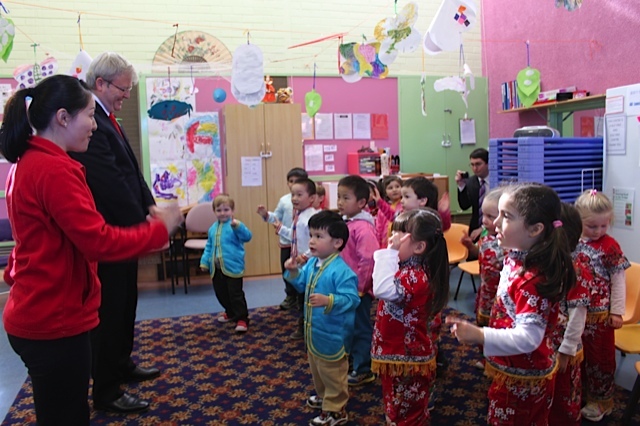 Children from ALMA's Chinese Australian Early Childcare Centre will be performing at 3pm. The year of the monkey will soon be upon us! Celebrate its arrival at the National Library of Australia with decorations, lanterns and a range of fun activities and performances, including by artists from the Shanxi Performance Group. Saturday, January 2 until May 22, 2016. The exhibition includes documents from the National Library of China's collection, some of which have never left that country before. It provides a window into nearly 300 years of life, culture and tradition of the last imperial dynasty that formed the foundations of modern China. Unlike some other exhibitions, it won't only focus on the life of China's elite at the royal court and that of the Dowager Empress, but it will provide a varied texture of all lives – from the peasants who lived in the fields to the market sellers and the middle class in the cities. Use your imagination in this hands-on, interactive area to explore life during China’s last imperial dynasty. 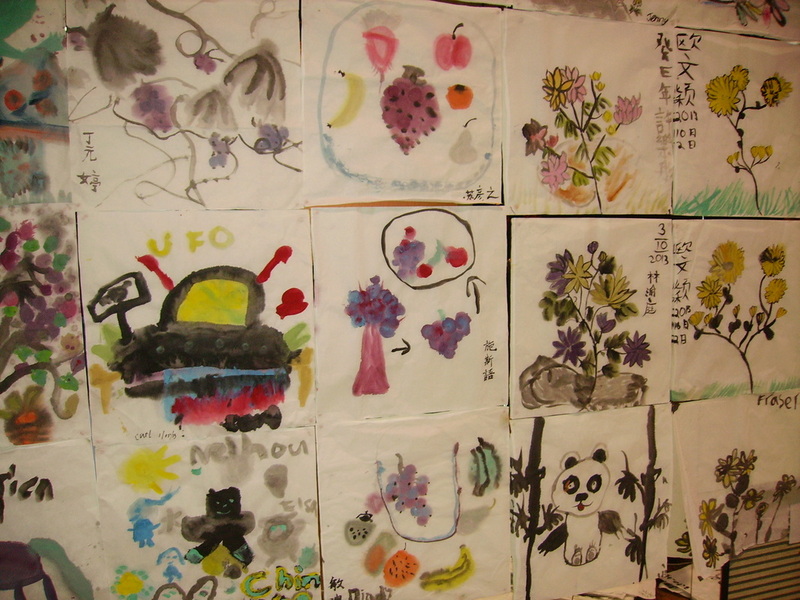 Kids and parents can contribute to a giant collaborative dragon artwork. Other activities will include puppeteering, craft, and colouring with ample space to curl up with a Chinese storybook. 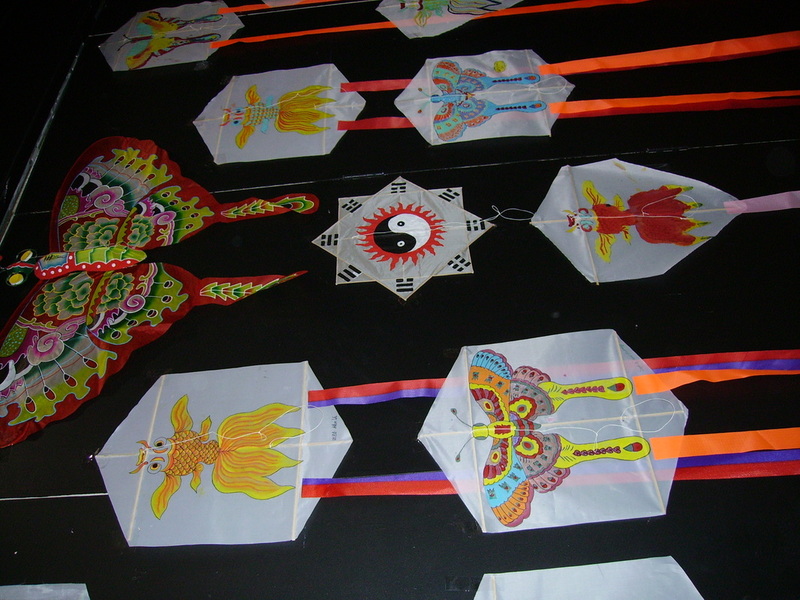 Learn how to make a Chinese lantern in preparation for the Lantern Festival. Adults and children welcome. The Lantern Festival is the final event of Chinese New Year. The site is decorated with Chinese Lanterns and lights and there are performances of Chinese traditional music, children’s dances, martial arts, lion dance, a hand-made lantern competition and a lantern parade. Where: Beijing Garden, Lennox Gardens, Flynn Pl, YarralumlaEntry: Free. Bring your own lanterns or buy one there. Prizes for best hand-made lanterns. A collaboration between Canberra Grammar School and the Australian School of Contemporary Chinese (ASCC). 10:00 am - 12:30 pm, 7 November 2015. 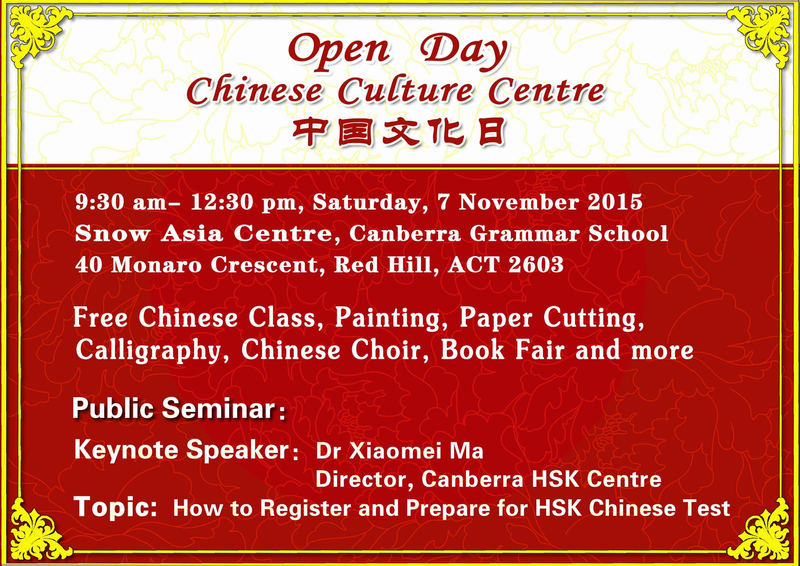 Free Chinese classes, painting, calligraphy, paper cutting, book fair and public seminar by Dr Xiaomei Ma, the Director of the HSK Test Centre in Canberra. By the ANU Chinese Classical Music Ensemble. Proceeds will be split with half going to the Ensemble to purchase new instruments and the other half to Project Hope*. * Project Hope is a national organisation in China which works in conjunction with the Youth Development Foundation. There are branches in most Provinces with the majority of schools in poverty-stricken countryside areas.The ACT Branch of the Australia China Friendship Society (ACFS) supports 13 students from Labagoumen, a school located in a remote mountainous region of Beijing municipality. It has 76 teachers, 414 students, 240 are boarders. ACFS started funding students at Labagoumen in 2002. All ALMA members and others interested in Mandarin language education and promoting knowledge of Chinese culture and heritage are welcome. If you are interested in nominating for the committee or assisting with specific projects, please have a look at the Roles and Responsibilities of the ALMA Committee and download and complete a Nomination Form. 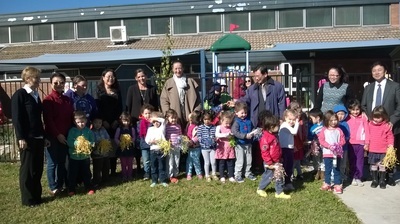 In April 2015, ALMA arranged the visit of Professor Ap Kup Vyt Vt (Luo Qing Chun) Dean of Yi Studies at the South West University of Nationalities in Chengdu to the Chinese Australian Early Childhood Centre and Mawson Primary School. 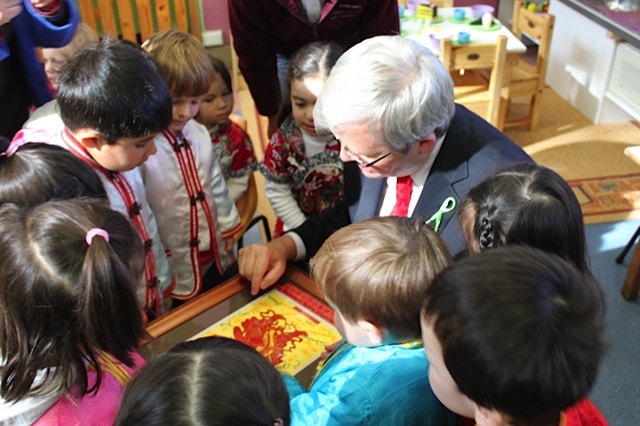 Professor Ap entranced the children at the centre with a traditional story in Mandarin, and wowed the students at the school with a poem in the Yi language. The professor presented gifts and paintings by his colleague to the centre, the school and also Ms Gai Brodtmann, member of the Australian House of Representatives for the seat of Canberra. Here are some pictures of the visit on 28 April 2015. Chinese students and Australian students will participate in the whole trip together to promote and deepen understanding and knowledge of Australian and Chinese cultures. The students will also establish international friendship and team spirit and improve their self confidence and communication skills. Accommodation: Homestay for 5 nights. Outdoor camping for 1 night. Hotel for 3. Students must stay with the group through the whole program. 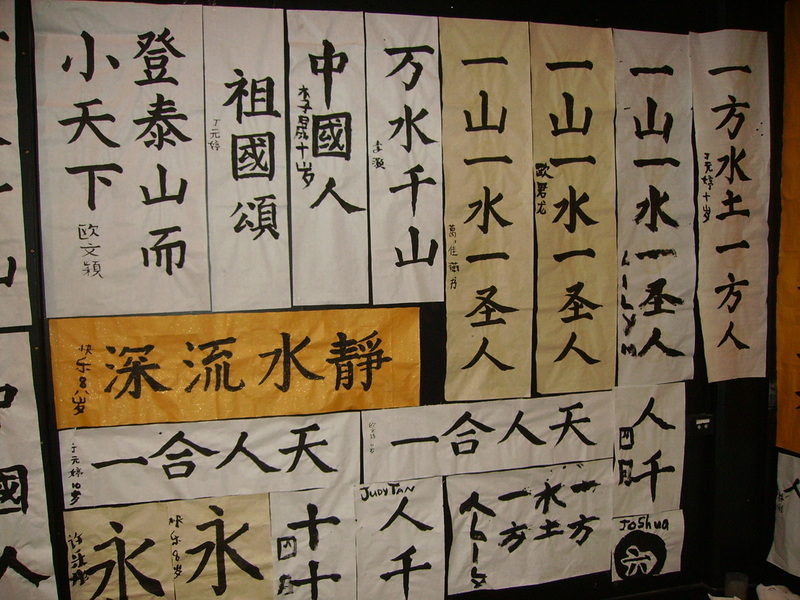 Recent research into the learning demands of Chinese shows that the cognitive and motor skills acquired in students’ development of their English (and most other first languages) at home and school, are an inadequate base on which to build L2 Chinese, and the few who do manage to achieve any real proficiency from classroom study usually still carry weaknesses predictable by this lack of foundation. To establish a solid base on which Chinese language learning can build successfully, it has been proposed that further cognitive and sensorimotor skill foundations need to be laid and learning developed from there. 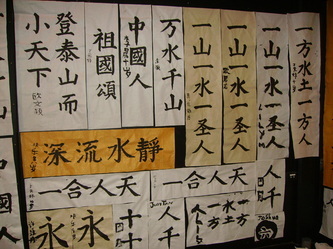 In this seminar, analysis of Chinese language as an object of learning requiring development of students’ cognitive base will be presented, and examples of teaching and resources developed by CTTC to address the problem will be introduced, including a series of Units developed with the assistance of the CIW. Both the proposition and the practical work are being very positively received internationally. About the Speaker: Jane Orton, PhD is Director of the Chinese Teacher Training Centre at the University of Melbourne, a research and professional development centre for Chinese language teaching. Entry: Free. Bring your own lanterns or buy one there. Prizes for best hand-made lanterns. The conference will bring together scholars from Taiwan and around the world to discuss research on Taiwan, pre-historically, historically and in the contemporary world, as well as from all disciplinary backgrounds. Screenings of 蔡明亮 Tsai Ming-liang’s three films will be shown and an exhibition of Taiwanese art will be opened at the CIW Gallery during the conference, featuring works generously lent by the National Museum of History, Taipei. A screening of Tsai Ming-liang’s 2013 prize-winning film Stray Dogs 郊遊 will take place on the evening of January 7, preceded by a discussion with the director. Two of Tsai’s recent short films, No Form 無色 (2012) and The Skywalk is Gone 天橋不見了 (2011) will also be shown during the conference. This film is also part of the series Asia and the Pacific Screens, Season Three: Survival Politics, sponsored by the Australian Centre on China in the World. Instead of the usual end-of-year concert, the FCCCI school tried something different this year. 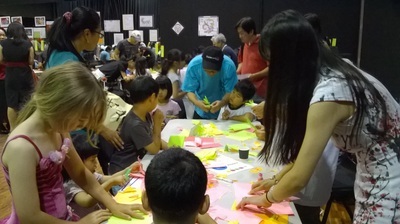 Tables were set up around the Lake Ginninderra College Hall where clusters of excited children enjoyed the experience of something related to Chinese language and culture, for example calligraphy, painting, clay modelling, cooking and making Chinese tea. Everyone was totally involved and absorbed - and children who collected stamps for completing a number of activities received a small reward. 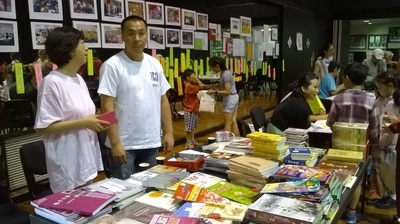 There was also a book stall with a great selection of reasonably priced Chinese language readers and other learning resources. Congratulations to all for a very enjoyable end-of-year celebration – especially the teachers and volunteers who organised the various activities. This was held on Tuesday 28 October, 6.30 to 7.15pm at the Chinese Australian Early Childhood Centre, 50 Ainsworth St, Mawson, ACT. We heard the committee report for 2013-2014 from the ALMA President and the report from the Treasurer, and elected the new committee for 2014/2015. We thanked members who were not standing for re-election, especially the outgoing president, Bridget O'Connor, for their great contribution to ALMA over the previous year, and welcomed several new faces to the committee. CLICK HERE to see committee details for 2014/5. Mandarin for Fun playgroup will host a free family fun learning Mandarin event to support and encourage bilingualism, which we have successfully achieved over the past 4 years. Come and enjoy performances by children and parents, games, craft, singing, dancing and healthy afternoon tea. Thanks for the support from the ACT Children's Week Committee and the West Belconnen Child and Family Centre. For catering purposes please register your interests to mandarinforfun@gmail.com by Friday, 17 October. For more details: contact Canberrabilingual@gmail.com, 0408 089 235 (Mandy) or see http://actbilingual.weebly.com/events.html. Much of what happens in the Tibetan Autonomous Region remains little known to outsiders, and it is not clear how much Beijing really know about these places and the people in them. How should we interpret the fragments of information that reach us about unrest and protests there, or indeed about the efforts of officials to deal with them? Linda Jaivin in Conversation with Geremie Barmé about her latest book Beijing. A monthly film series that offers a fresh window on social realities, cultural transformations and creative imaginings from across Asia and the Pacific, through documentary and feature films made by some of the most entertaining, insightful and uncompromising filmmakers in our region. Screenings are followed by a short discussion, led by relevant local and invited scholars and filmmakers. This project was made possible by the support of the ACT government’s 2013-14 Participation (Multicultural) Grants Program. ALMA helped organise this event on 3 April 2014 at the new China in the World (CIW) building on the ANU campus. 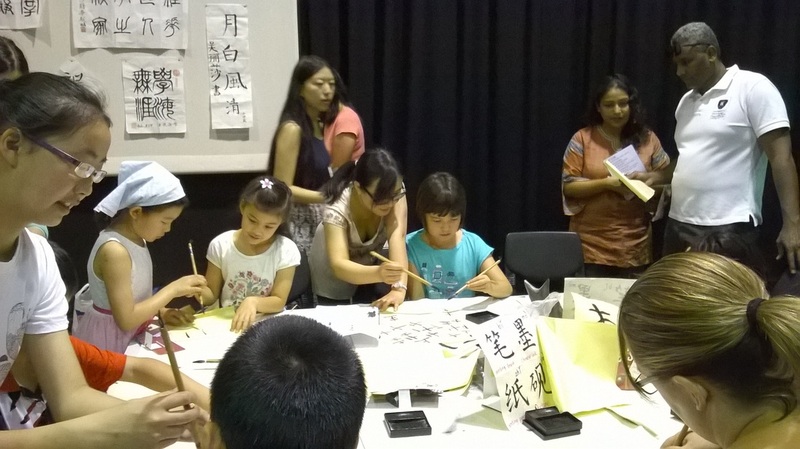 The event was funded as part of a CIW grant "to develop ANU's links with schools, the community and other relevant organisations and groups to promote and improve Mandarin learning and teaching in the ACT region". The program included short talks about the symbolism of new CIW building (Dr Ben Penny, Acting Director CIW), ALMA's aims and activities (Bridget O'Connor, President ALMA), and Chinese programs and ANU outreach activities (Dr Mark Strange, Head of Dept of East Asian Studies, ANU School of Culture History and Language). Three of the ANU students nominated for awards for their Mandarin studies in 2013 spoke about their Mandarin learning journeys. There was then time for questions and information sharing before Dr Strange presented the students’ awards. 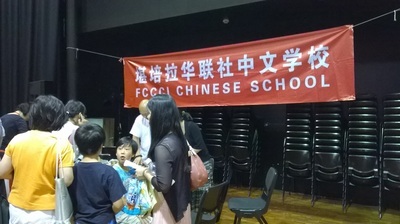 Over 35 people attended, including Mandarin teaching staff from ACT schools, ANU lecturers and tutors in Chinese language and culture and members of community groups which promote interest in China and Mandarin. Some useful links were made and it is hoped that this will result in more support for Mandarin programs at school level. One of the outcomes was in response to a request for details of competitions and other activities schools can tap into to arouse and maintain student interest in learning Mandarin and more about China. ALMA has put a new page on its website to meet this request. For children 3-7 years old. One story is read aloud in Mandarin and then in English, followed by an activity introducing basic numbers, words and phrases in Mandarin. Run by Libraries ACT volunteers at Dickson Library on Sundays in May 2014, 2.30-3 pm. FREE but bookings requested for each session (look for the event at www.library.act.gov.au/learning/whats_on) . Enjoy colourful Chinese lanterns and lights, and performances of Chinese traditional music, children’s dances, martial arts, lion dance, hand-made lantern competition and a lantern parade. This forum was organised by ALMA in cooperation with the College of Asia and the Pacific at the ANU and the ACT Directorate of Education and Training, and was supported by a grant from the Australian Centre on China in the World at ANU. encourage language maintenance among Canberrans of Chinese background and heritage. For a summary of the day's discussion and outcomes CLICK here. See below for Powerpoints used by Dr Jane Orton and Dr Mandy Scott in their presentations about the current situation in Australia and the ACT region respectively. 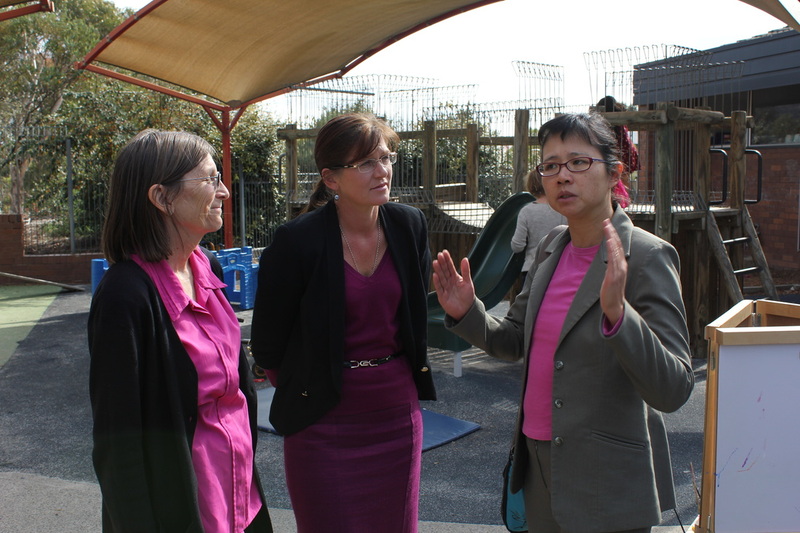 ALMA was delighted to meet with Senator Kate Lundy on Tuesday 16 April 2013. 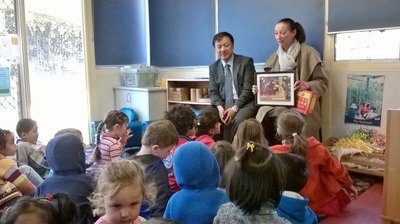 The Senator toured our Chinese Australian Early Childhood Centre in Mawson and was interested to hear about ALMA's plans to expand its operation. 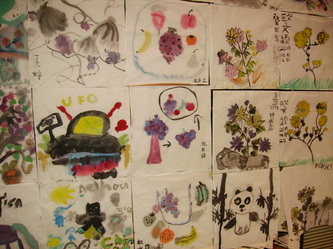 We also discussed ALMA’s ideas about promoting the learning of Mandarin in the ACT more generally. Congratulations to the Australian School of Contemporary Chinese for organising a very successful camp at Lake Ginninderra College during the October school holidays. 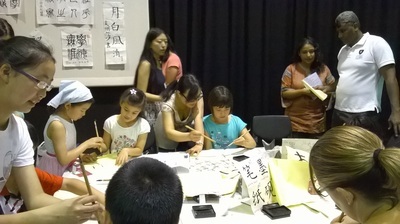 Over 140 students attended and had fun in a number of activities while being immersed in the Chinese language. The results of some of their activities, which included Chinese Kung Fu, Clay Sculpture, Chinese knots, Calligraphy, Traditional Chinese Painting, Peking Opera Styles of Makeup, Paper-cuts, Singing and Dancing can be seen in the photos below. The camp was supported by the China Overseas Exchange Association (Qiaoban), Shandong Overseas Exchange Association and the Chinese Embassy in Australia. Celebrate the beginning of the Year of the Snake with spectacular traditional lion dancing and other performances at Stage 2 in Petrie Plaza in Civic, Canberra City. A FREE event as part of the 2013 Multicultural Festival. See http://www.multiculturalfestival.com.au/signature_events/chinese_new_year_in_the_city for more details. CELEBRATE CHINESE NEW YEAR WITH STORIES FROM CHINA! Stories and songs in English and Mandarin. Come and learn some simple Mandarin Chinese words and make a Chinese red paper lanterns and other craft to celebrate the Year of the Snake! This event is free and is suitable for all ages. Bookings are not required. 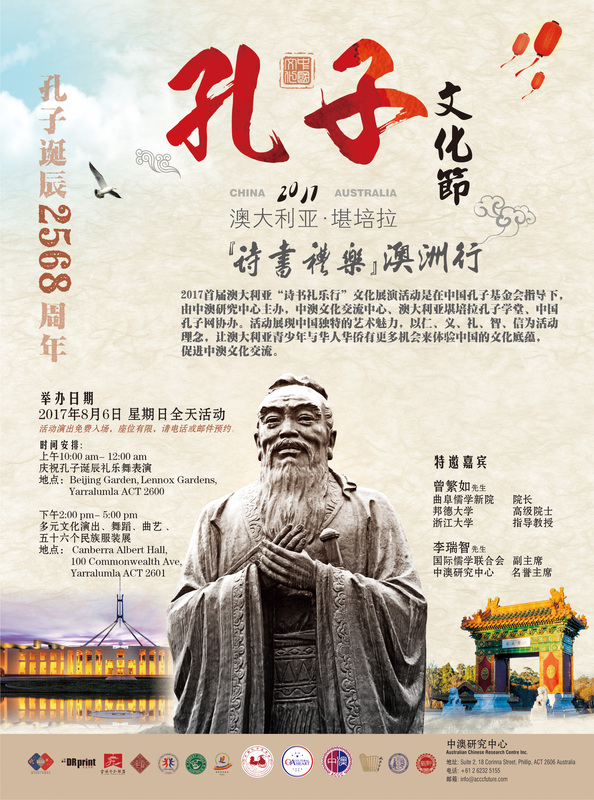 Enjoy the colour and spectacle of this annual event organised by the ACT Australia China Friendship Society in Commonwealth Park near Gallipoli Reach (west of the Rond Terraces, below ANZAC Parade). Entry is Free. Bring your own rug and picnic in the park. Entertainment includes a Chinese Classical music ensemble, Children’s dance groups, and a kung fu demonstration. The evening concludes with a lantern parade - bring your own lanterns or buy one there. 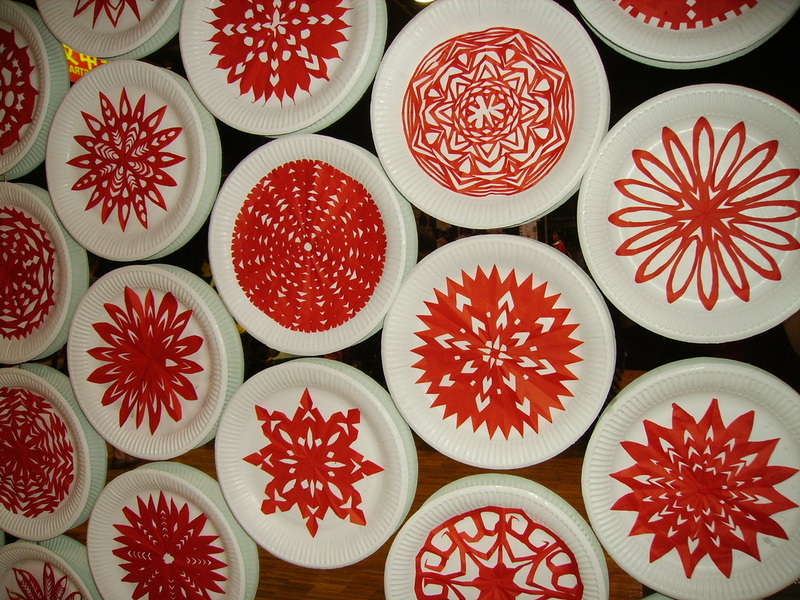 Prizes for best hand-made lanterns (see below for details of a lantern-making workshop. 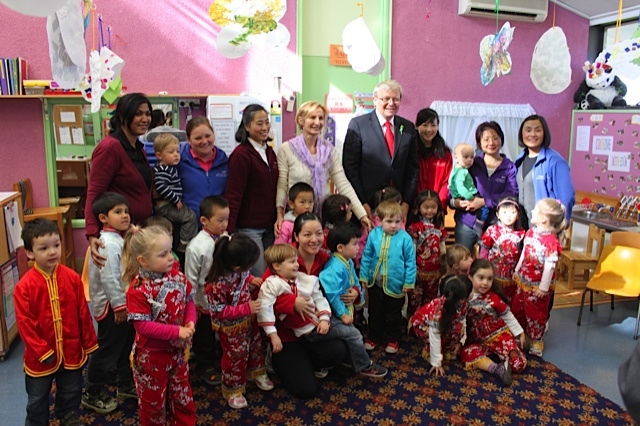 ALMA was delighted to host the Hon Kevin Rudd MP at our early childhood centre in Mawson on Tuesday 22 May 2012. 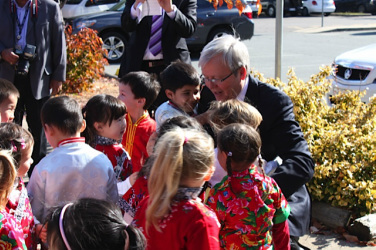 Mr Rudd was welcomed by our preschool children, who then sang songs in Mandarin (one led by Mr Rudd! ), asked many questions and enjoyed showing off their dancing skills. 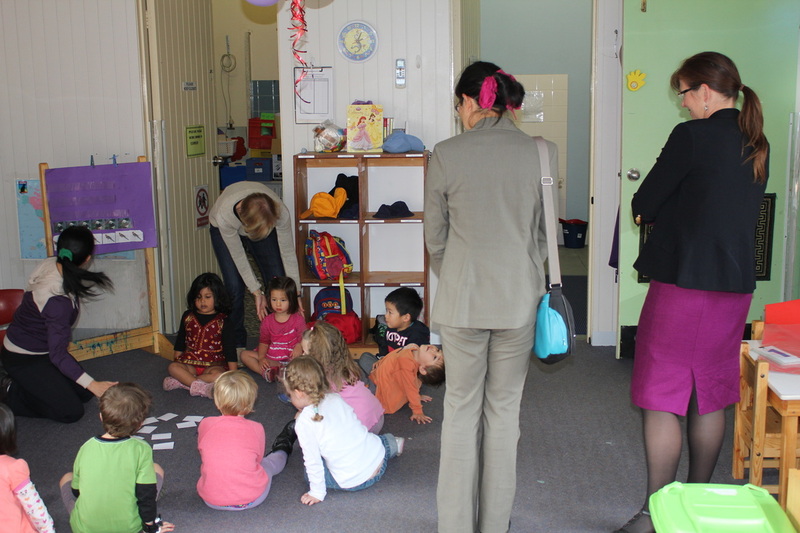 The visit gave us the chance to show how a small community-based centre can provide quality care and education, and also prepare young Australians for the future - by offering a play-based bilingual environment from babyhood up - when children are most receptive to language learning. ALMA made a submission to the White Paper on Australia in the Asian Century in February 2012. In this we emphasised the value of language learning, especially Mandarin, in the early childhood setting, in order for us to improve our engagement with Asia. support for initiatives which seek to capitalise on the cultural and language knowledge already within Australia – in our multicultural population and the large numbers of international students from Asia studying in our schools and tertiary institutions.